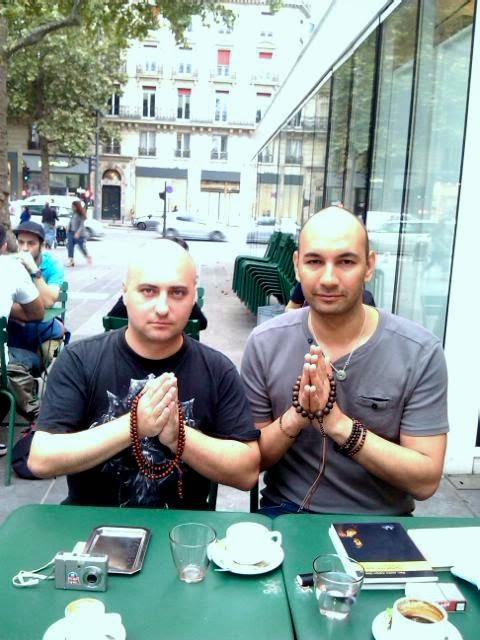 I met with my Dharma friend Frank Kusmierz. 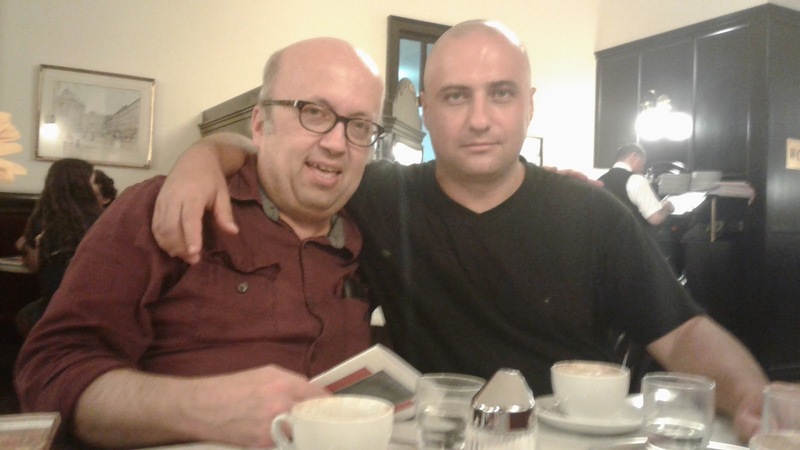 I offered some books in the memory of late Myoshin Friedrich Fenzl, and we had a wonderful evening with discussions and cofee. I met with my good friend from Holland, Frits Bot, who donated many good books for the library of Amidaji temple. These include, Rennyo-sama, His Life Through Pictorial Illustrations, Life of Eshinni by Yoshiko Ohtani, two books by Eiken Kobai Sensei, some biographies of Shinran and Honen, and a few good studies on the history of Jodo Shinshu. The following is not a detailed and objective report of the 18th European Shin Buddhist Conference, but only some significant events for myself and my mission. Through the benevolence of the International Association of Buddhist Culture I will be able to attend, together with three members of Romanian sangha, the 750th Memorial of Shinran Shonin and the European Conference that will be organized on this occasion between 8th to 11th September in Kyoto. 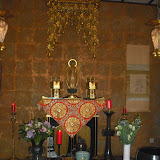 Here are some pictures from the spring meeting in Jiko-ji temple (1-3 May 2009) Antwerp, where I could attend due to a grant offered by Eko Haus der Japanischen culture to which I am deeply thankful. I returned from Eko-ji temple in Dusseldorf last night and now I have to make a little more journey until I finally relax at home. This meeting was one where I couldn't become bored and this was due to the teacher Eko Haus der japanischen kultur invited - Noriaki Matsuo Sensei - who I think was the best teacher ever came to Eko Haus since I attend this kind of meetings. He gave a lecture on Shoshinge and as far as I understood from the passages translated by Marc and Chisho Frank(second picture), his commentaries were excellent and with no trace of that kind of sophisticated scholarship I don't like. Also I didn't find any distorsion of the teaching in his lecture, but only good explanations in accordance with the words of Shinran. This Sensei is rather young and unknown to the European public and I hope Eko Haus will continue to invite him at future meetings. All the participants engaged in useful Dharma discussions on many topics related with Shoshinge, which into my opinion, made this meeting a true nembutsu meeting, one of the few that actually take place in the international sangha. I was indeed satisfied with everything happened there, not only with the lecture and talks with old friends, but also because of the Dharma discussions I had with new members like David Cwila. After the Hoonko ceremony I could give books to visitors who attended it and others that were present in the Eko Haus. Among these gifts were the two books of Eiken Kobai Sensei printed by me at Dharma Lion. In total I gave 18 books to visitors and members, including THUS I HAVE HEARD FROM RENNYO SHONIN. Finally, I had a beautiful surprise from my German friends who invited me to be an official member of their sangha. I consider it to be a beautiful symbol of unity and a recognition of our friendship. I give my thanks to all the people who made this meeting possible, and those who attended it, but especially to Aoyama Sensei(third picture) - the abot of Eko-ji temple and president of Eko Haus and to those who helped me to understand the lecture and discussions which were only in German: Marc Nottelman and Chisho Frank. May the European Sangha grow and stay united in the true Jodo Shinshu teaching of our Masters! Some pictures are almost identical so that European sanghas can chose which is the best to use for their magazines or websites. Here you can see some of the pictures I took from the 15TH European Shinshu Conference and the video recording of kikyoshiki ceremony. A recording with Kobai Sensei's important statement from the Conference will come soon! I am now ready for the very important trip to the 15th European Jodo Shinshu Conference in Bad Reichenhall, Germany. I will be back home at the beginning of September, so until then, I might not be able to write something here. I packed my things and the books I always carry with me, among them, “The Collected Works of Shinran”,”The Three Pure Land Sutras” translated by Inagaki Sensei, Zuiken’s Shinshu Dharmapada, Eiken Kobai Sensei’s books, my audio recordings after some traditional texts, etc. I never go anywhere without some Dharma books and a note book to write my impressions. The Romanian delegation to this Conference is composed of 4 people: me and three other members of Tariki Dojo Craiova, who will receive kikyoshiki on the occasion of this Conference. They are the second wave of Romanian Jodo Shinshu Buddhists who receive this rite and Buddhist names from Go-Monshu-sama Koshin Ohtani, the Patriarch of our tradition, since I founded Tariki Dojo, in 2004. There are still some other members here in Romania who might receive it at the next Conference. But for the moment I decided to wait and see how they will continue in their Dharma study and practice. I am just waiting to meet some old nembutsu friends and others I have never met face to face but inspired me through correspondence, like Jason from Norway and the very important, Eiken Kobai Sensei. I deeply regret that Paul Roberts can’t attend this Conference, but I hope that he will become an every time presence at future Conferences. Sometimes it is indeed funny to find myself sleeping, but other times I feel great pain and thoughts of retreating in the mountains or closing myself in my dojo, without talking with anybody, often come to my mind when I hear some well spread wrong understandings that I can’t imagine it exists in people’s minds. I go to this Conference with a dual mind, so to speak: joyful to meet my true nembutsu friends and teachers and fearful of what I and new comers might hear there. While I myself know that I am truly settled in shinjin, I am especially worried about the new comers. Lets hope the papers and presentations, as well as the discussions, will be faithful to Shinran Shonin’s teaching.